Before the twentieth century, Scandinavia was almost entirely unknown to other Europeans. The Renaissance had failed to reach it with the same magnitude as the rest of the Continent and Norway was not Christianised until as late as the early thirteenth century. After the fall of the Viking Empire, Norway was in fact close to dying out completely. The Kalmar Union of 1397 meant it became the oppressed partner in a union with Denmark and Sweden, and it was not until 1905 that a Swedish king, Charles XIII, finally relinquished control of the country. Far from embracing this new found independence with open arms, however, Norway panicked. 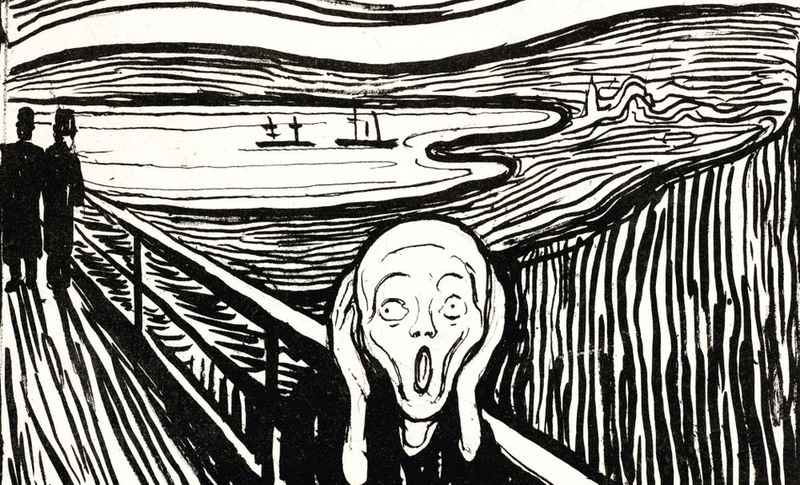 Edvard Munch’s painting of 1893, The Scream (Skrik), perhaps the most parodied painting in history after Leonardo’s Mona Lisa, personifies a collective Norwegian shock having to fend for themselves in an ever changing, rapidly industrialising world. As in the painting, the world moved on while Norway stopped and screamed at its crippling lack of self-confidence. Industrialisation had scarcely reached Norway, and with the factories of Malmö, Gothenburg and Stockholm snatched away on independence, it was down to cities such as Bergen, Stavanger and Oslo to take up the baton. They took up the challenge, but change was painfully slow, and, just as industrialisation seemed complete, in April 1940 the Nazis invaded. As in its other conquered lands, the Wehrmacht obliterated everything in their path, and anything they themselves built was destroyed by a strong Resistance movement. By 1945, as the Germans withdrew, there was, essentially, nothing left. But, as in France and Britain, the Second World War left a gaping hole for Socialism and the emergence of a welfare state. The post war period marked the birth of a Norway – and Scandinavia – we all recognise, where citizens frequently hand their government more than half their earnings, but are rewarded with some of the world’s most effective social security systems. Under the premiership of Prime Minister Einar Gerhardsen, Norway was transformed from a poverty stricken, backward land, to a cultivated, forward thinking European powerhouse. This transformation, though, was understandably disorientating. And, just as the population adjusted, on 21st August 1969, oil was struck. The government rushed to nationalise the reserve, but however much it tried, some of this new-found wealth inevitably trickled into the hands of citizens. Jo Nesbø responded to the self-indulgence of Norway’s oil mania. Through his Harry Hole novels, since published in over fifty languages, he expresses disillusionment and alienation with his country’s new identity; its greed and the ruthless criminal underworld that formed as a result. Harry’s world is one of corruption, deceit and dangerous pragmatism. Sweden, unlike Norway, struck no oil, but was certainly no poorer. With a strong economy, benevolent welfare state and a feeling of unbreakable security, neutral (if collaborative) Sweden emerged from the war happier than ever. That was before Maj Sjöwall and Per Wahlöö scard it with Martin Beck. Beck was the beginning of Scandinavian noir as we know it, the unique blend of traditional crime fiction and an unsubtle jab at societal flaws. The Beck novels were an instant success both in Scandinavia and abroad, but Beck did little to dent foreign perceptions of a Nordic paradise. On the night of 28th February 1986, however, they were shattered. Swedish Prime Minister Olof Palme was walking home from the cinema with his wife, Lisbet. He had shunned police protection for the evening and, as he rounded the corner of Sveavägen, he was shot in the back from point blank range. After a taxi driver raised the alarm, Palme was rushed to hospital, but died shortly after. His attacker walked calmly onto Stockholm’s metro system and disappeared. Sweden descended into shock. The very self-confidence in their security that had meant their Prime Minister did not require protection that night was under threat and many began to question whether their country was really free from the evils suffered by the rest of the world. But while most of society panicked, writers rejoiced. Palme’s assassination, like Kennedy’s, opened the door to countless conspiracy theories: prime material for them to devour. Henning Mankell, like Sjöwell and Wahlöö, wrote from a profoundly Socialist perspective. A successful dramatist in Stockholm during the eighties, it was in 1991 that Detective Kurt Wallander first came to the attention of Swedes, and Brits soon after in 1997. Wallander’s home town of Ystad, in southern Sweden, is a metaphor for the country as a whole, post-Palme. An idyllic backwater where, all too sadly, bad things happen. And Wallander’s left-wing but subdued, calm recognition of this is vital to the stories’ success. It’s Wallander who points out what was to be yet another blow to the Swedish welfare state: new waves of immigration. 1991, when Faceless Killers, the first of the Wallander series was published, saw the fall of Communism in Europe. With the Iron Curtain swept aside, former Communist citizens flocked to Sweden. Few doubted the welfare state wasn’t strong enough to cope. And, thankfully, they’ve been right so far, even with 98,216 Syrian refugees now living in a country of just ten million. The Millennium Trilogy is now the most successful ‘Nordic Noir’ franchise. It was also one of the first to represent Sweden’s rising xenophobia. The trilogy’s protagonist, Lisbeth Salander, is anti-social and incredibly ugly, covered from head to toe in tattoos. She is, some say, the very personification today’s Syrian refugees: physically and mentally out of place in their surroundings, facing a hostile native population. Denmark’s xenophobia is perhaps more worrying, as it concerns an alienation of their own colonial subjects, the Greenlanders. With their Asian appearance, a Greenlander in Copenhagen is instantly recognisable. Peter Høeg is one of the only writers to have created a book centred on the subject: Miss Smilla’s Feeling for Snow. Smilla, a native Greenlander, arrives in metropolitan Denmark with a continual longing to return to her homeland, and when a fellow Greenlandic boy falls to his death in her apartment block, an ineffectual police force means she must investigate it alone. As ‘Nordic Noir’ continues to grow, many are questioning just why we, and the Scandinavians, love to consume it. I think there must be some Viking flare still in us, some connection with Scandinavian literature we don’t get from the ‘Mediterranean Noir’ of Inspector Montalbano, the Chekhovian darkness or the French despair. Both Britain and Scandinavia have long, cold winters, an innate social awkwardness and a desire for justice to be achieved. We love to watch Montalbano sipping an expresso in the Sicilian sun, but it’s not real life. Wallander working long hours, very tired, living alone and suffering from the early stages of Alzheimer’s is, all too sadly, more like the real world. And for Scandinavians themselves? While tragic events do, of course, occur, these nations are still unbelievably safe. The noir they tune into is an imagination of a very different world, one that, for them, doesn’t usually exist. They can settle down to watch The Bridge or The Killing, then look out of their window and see that everything is calm, orderly and clean.